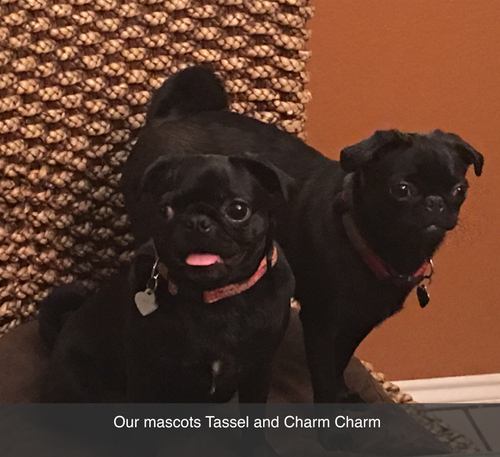 A few months ago Charm Charm, Tassel & I moved from a small bungalow to a much larger home where I can recharge my being & body, welcome friends for social fun times and also enjoy a delightful work space. I love so many things about our new home, we now live in West Oak Hill so we’re so very close to everything fun & fabulous AND our new home has a HUGE amount of wall space that are painted the most perfect bronzy brown to showcase artwork by Austin artists!!!!! 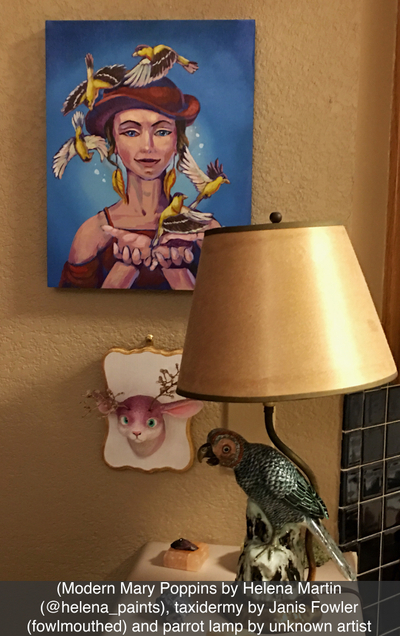 One of my questions to myself was…...Where do I start to install my artwork?? Which walls are going to be in my constant view??? Also “Am I willing to live with empty wall space til I purchase more local artwork?”. I just completed curating the wall that I see every time I come home, do laundry & putter around…..
My second priority wall is in the main room where we eat, socialize and home office (love having a huge multi-use table). The main wall has artwork on about ⅓ of the wall and I’m so far beyond excited how these 4 pieces of artwork look!!!!! I kept rotating artwork onto & off of this main wall for a few months; it was when I procured the Mikey artwork by Janis Fowler that I realized that “Mikey” was the fulcrum for this wall. 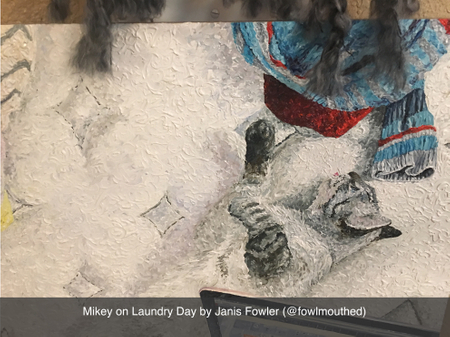 I included the close up photo, I used Lily’s woven art to hide the ugly light switch & also created a bit of whimsy of Mikey playing with the weaving!! Another area of art is in a small sector that I SEE all the time!!! 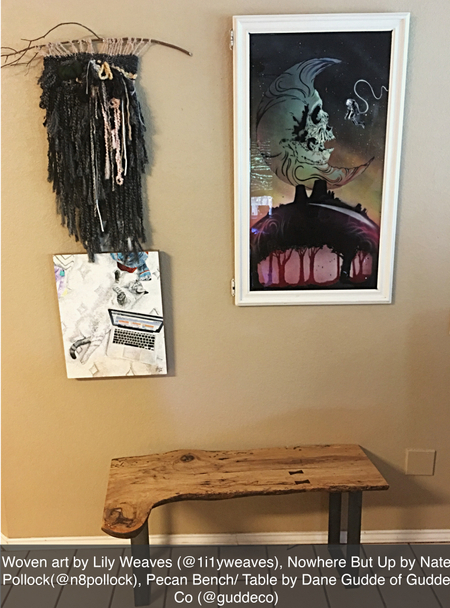 I purchased Modern Mary Poppins by Helena Martin during the West Austin Studio Tour 2017 and I immediately knew where the artwork was going to be placed. 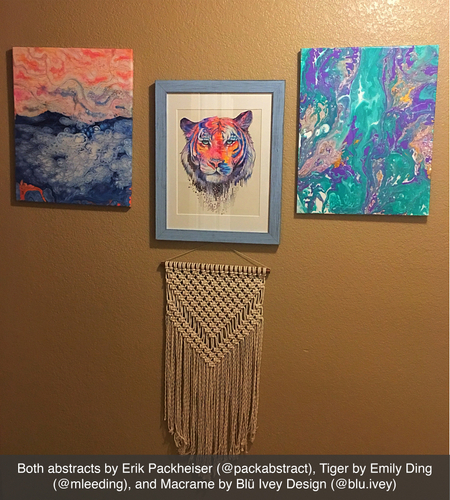 I adore all my artwork & I have so much fun and enjoyment curating my art in unique ways (fyi I’m not a great “hanger” of artwork since I rarely measure & just recently purchased a leveler)!!!!!! And I’m not “panicking” that I have open wall space since I know that local artwork will be joining our “family” in the future. I’m so very ecstatic that 90% of my artwork is created by Austin Artists!!! Please support our ATX Artists by purchasing their stellar artwork!! !